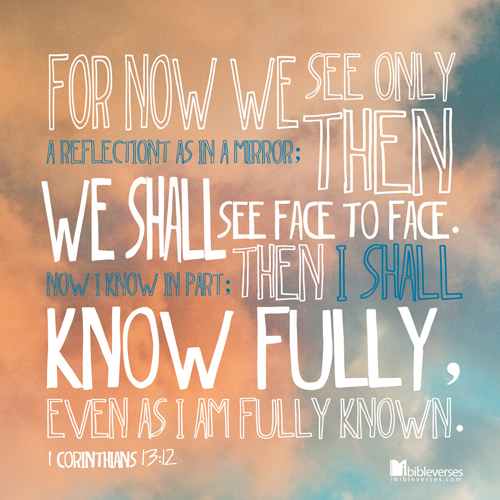 When the Apostle Paul wrote to the Corinthians about seeing in a mirror dimly, he was using good contextual communication. Corinth was a noted manufacturing center of mirrors. They knew that even their best mirrors, made of polished metal, could only yield a partial reflection of reality. “For now see in a mirror dimly” made perfect sense. Paul uses this illustration to draw a contrast between our life in Christ in the present and the life that awaits us in the future. Notice Paul’s repetition of the words “now” and “then.” Now we walk by faith with Jesus – a wonderful thing! But there is mystery, there are unanswered questions. Like looking in a mirror dimly. Then, in the future that will be ours when Jesus returns in power and glory, we shall be face to face. 1 John 3:2 anticipates this joy: “we shall see him as he is!” Now we know in part. So, let’s have some humility. Then we shall know fully. The best is yet to come! Please do not miss the astonishing conclusion to 1 Corinthians 13:12: “even as I have been fully known.” There is nothing future-tense about this declaration. It is already true. You are fully known, right now. What does that mean? The Lord God, maker of heaven and earth, who puts the stars in their courses, who spins the whirling planets, knows you! God knows all about you: your past, present, and future; the hairs on your head; your potential for greatness; your propensity to sin; your capacity for love; your fears and weaknesses. David, King of Israel and writer of psalms, grasps the magnitude of this: “O Lord, you have searched me and known me…You are acquainted with all my ways…Such knowledge is too wonderful for me; it is high; I cannot attain it!” (Psalm 139:1, 3, 6). The Hope session (the 12 elders who lead alongside our pastors) have named “fully known” as our current strategic focus. It is a richly biblical idea. to grow in being fully known to one another in closer community at Hope Church. As the Apostle Paul says in Romans 8:38-39, “I am sure that neither death nor life, nor angels nor rulers, nor things present nor things to come, nor powers, nor height nor depth, nor anything else in all creation, will be able to separate us from the love of God in Christ Jesus our Lord.” Jesus Christ, the one who fully knows us, is the very one who fully loves us. We can count on that – now and forever!